Made in the wood workshops of Botton Village of oiled hardwood supplied and sourced by their own sawmill from either the community's own managed woodland or their timber recycling program. Today the Botton woodshop is one of the largest and longest established of all the Camphill workshops providing meaningful employment to over 30 individuals range a range of skill levels yet great pride in the objects produced. Beloved by small children the ducks feet slap satisfyingly on the floor as it is pushed along. 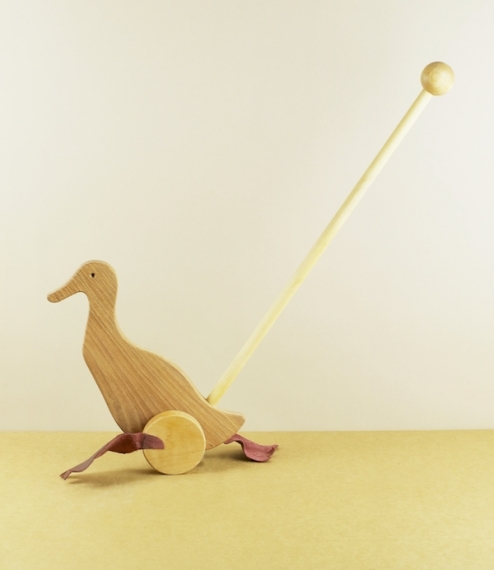 The duck itself measures about 26cm from bill to tail, and the handle in the region of 45cm. In 1939, inspired by the ideas of Rudolf Steiner, Karl König created his first community for the learning disabled at Kirkton house, near Aberdeen. By 1940 they had moved to the nearby Camphill estate, from which the now worldwide movement still takes its name. Their purpose being for people of all abilities to live and work together in an environment of mutual care, interdependence, and respect. To this end each community is built around a series of workshops where their members can be taught and develop skills in a range of sustainable activities from agriculture to bookbinding to carpentry.